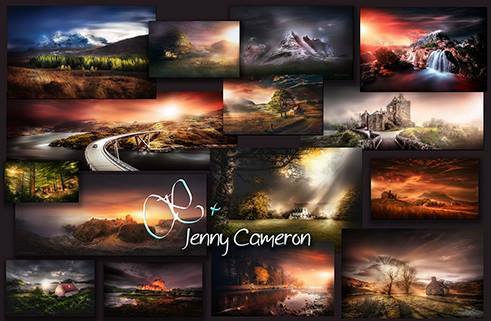 Jenny Cameron- Proffesional Landscape Photographer living in the Scottish Highlands with her Husband and two dogs. Her passion for the wilderness began from a love of travel & outdoor life. Sadly Jenny was diagnosed with a rare bone disease a few years ago in her hip called Avascular Necrosis. This put an end to her mountain adventures ( hiking, winter climbing, skiing, backpacking to name a few). She spiralled into a dark place for a short time but thankfully found her solace in landscape photography and her journey began in October 2015 never looking back. 2016 was a great year, several of her images were exhibited in three American art galleries. Followed by her first publication on the front cover of the prestigious Scottish Field magazine January 2017 issue, displayed in all major newsagents & supermarkets across the UK. 2017 brought ten of her Scottish images published in two different Coffee Table style Photography Books. A publication of her most popular monochrome images in Black magazine, March issue. July, one of her most popular images “Altnaharra” was chosen for display in an English art exhibition. 2018 was a great start. Firstly a great honour becoming UK Official Photographer for Haida Filters. Next came a publication offer for an interview as feature photographer in Photography Masterclass magazine March edition. April brought a wonderful hard backed book publication showcasing ten of her most recent Scottish images for WePhoto publishing company. May, invited to exhibit indefinitely a selection of her landscape portfolio in a gallery in Glasgow. July, Photography Masterclass magazine Published her very first post-processing tutorial, unveiling her unique style. Kicking off 2019- January; Haida Filter Instagram take over. March, thirteen images published in Eye-Photo magazine. Jenny continues pushing boundaries and looks forward to the future.